REDUCED! 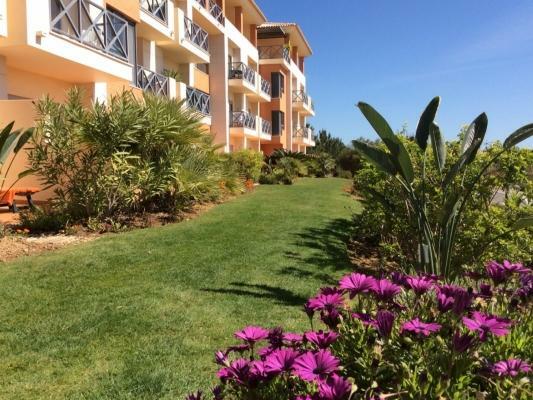 2 bed South facing apartment with rental income & sea view - Property for sale. Full Description: Lovely second floor South facing 2 bedroom apartment located in the Corcovada complex very centrally located in Albufeira close to the "Bull Ring" roundabout. There are 252 apartments in total, split into 4 separate condominiums each with it's own swimming pool and gardens. All amenities are just a couple of minutes walk including an abundance of shops, bars, restaurants and beaches, so no need to hire a car if on holiday. Completed in 2008, this apartment offers light and spacious accommodation with top quality fixtures and fittings used throughout. Accommodation comprises an entrance hallway, fully fitted and equipped kitchen with a full range of Siemens appliances, lounge/dining room, storage room, 2 double bedrooms each with fitted wardrobes and wooden flooring, 1 bedroom has en-suite bathroom and another private terrace and there is another full bathroom. The living room has access to a private South facing sun terrace with distant sea view and overlooking the gardens. There are numerous extras as you would expect from an apartment of this quality including, spot lights throughout, double glazing, electric shutters, security video entry system, central vacuum and air conditioning. The apartment also benefits from wifi internet with tv box showing all UK channels, also has an allocated parking space in the remote entry underground garage. This is a desirable apartment with excellent rental history and will be sold fully furnished and equipped and with any existing bookings. Viewing highly recommended.